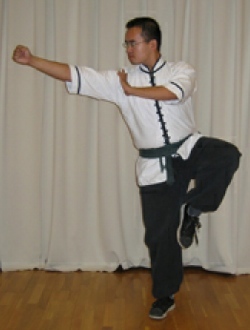 Jia men chang quan (Islamic style long fist), as handed down to Master Kurt Wong by Master Adam Hsu, is one style in a very large family of styles covered by the name Long Fist. It is characterized by proud, upright stances and long range movements, though its practical applications may be short range. 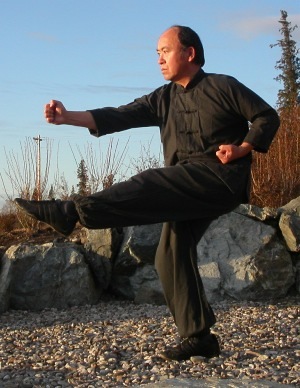 Though long fist is a stand-alone style, at Wu Tan Alaska it is taught with emphasis on conditioning the body to prime the student to learn other styles of kung fu and tai chi. It is ideal for strengthening, stretching, and toughening muscle and tendon, as well as mind and spirit. With this in mind, the following excerpts from Adam Hsu's "Lone Sword Against the Cold Cold Sky" convey the essence of the style by one of its foremost practitioners. "Among a couple hundred Chinese martial art styles, it's a pretty safe bet to say that long fist (chang quan) is the largest style of them all. Now, if you count heads based only on the name "chang quan," you are likely to lose your bet. But as a matter of fact, as a matter of reality, long fist is truly the largest. Some styles in this family are actually called "chang quan:" tai zhu chang quan (tai zhu long fist), jia men chang quan (Islamic style long fist), mei hua chang quan (mei flower long fist), and so forth. 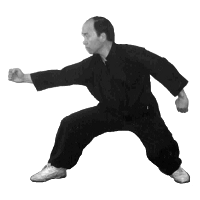 Others have totally different names, but still are long fist: for instance, mizong quan (lost track style) and even taiji quan (grand ultimate style). Yes, taiji quan is chang quan. Long fist technique is rooted in ancient Chinese philosophy. Its theory emerged from China's traditional wisdom. Long fist fighting techniques, based upon this theory, evolved over centuries of trial and error: private bouts, skirmishes to defend family, employers, and villages, and the bloody battlefields of war. Chinese martial arts has a huge number of impressive fighting styles. Some are quite unique, many are superb. What makes long fist stand out among them, what makes it unique is the balance and even development of its techniques and its versatility in fighting situations. Does it emphasize arm or leg techniques? Long fist develops both. How about long-range, midrange, or short-range fighting? Where is its strong point? Not a relevant question: long fist uses all of them. Does it specialize in palm strikes? No, long fist uses fist, palm, elbow, shoulder, torso: everything and everywhere. Does long fist's fighting strategy call for initiating the first strike or waiting for the opponent to attack before responding? Long fist uses all different fighting strategies. And very importantly, the fighting plan must never be pre-designed. ....You could say that long fist provides "equal opportunity" training for the entire human person. Its more generalized approach is quite comprehensive and develops the student's abilities in a more even manner. It prepares its practitioners to face any situation with an arsenal of different techniques at their disposal. Looking at it from this point of view, we can see how many kung fu styles grew out of long fist. Long fist is like a mother to northern Chinese martial art styles. All of her children carry characteristics inherited from the mother, yet each has its own personality, interests, and abilities. Each picked a certain area or perhaps several techniques from long fist and developed them fully, in many cases pushing them to a very high level. .......When a child starts practicing kung fu, it's almost impossible to know where his potential lies or how good he can be. In the field of music, for example, we may see that a child has great ability. But will he be a composer, conductor, a vocalist, master the cello? Will she become a professional, a talented amateur, a world-class performer? Most often, we first steer children to the piano and later on, support their interest in other instruments such as drums, or fields such as film score composition or musical analysis. ......Long fist is known for its proud and courageous spirit which clearly can be seen in its forms: the postures are dramatic and expansive; the movements are complex and elegant. They are very beautiful to watch. When performed by a high-level practitioner, an additional depth and power shine through."